Double Crunch Honey Garlic Pork Chops. Juicy on the inside but super crunchy on the outside, these double dipped pork chops get dipped in an easy, flavourful Honey Garlic Sauce. These Honey Garlic Pork Chops taste even better than they look. 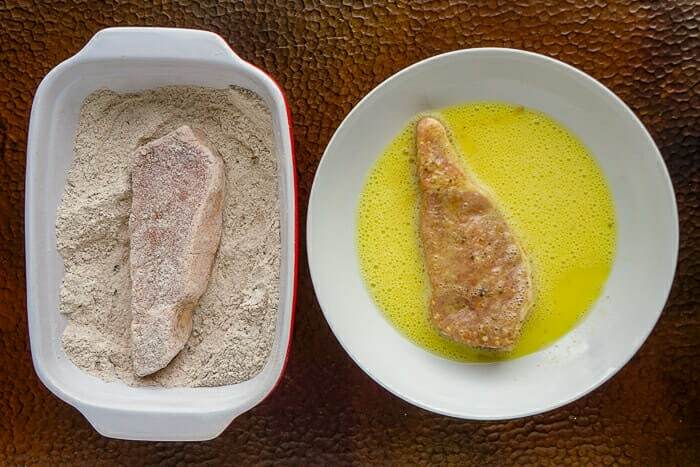 Today’s recipe combines a couple of past ideas that have appeared on Rock Recipes; one another pork chop recipe and one a chicken wing recipe. One of my favourite comfort food meals is Chicken Fried Pork Chops served with mashed potatoes and gravy. One of my favourite chicken wing recipes is the very popular Crispy Honey Garlic Wings. 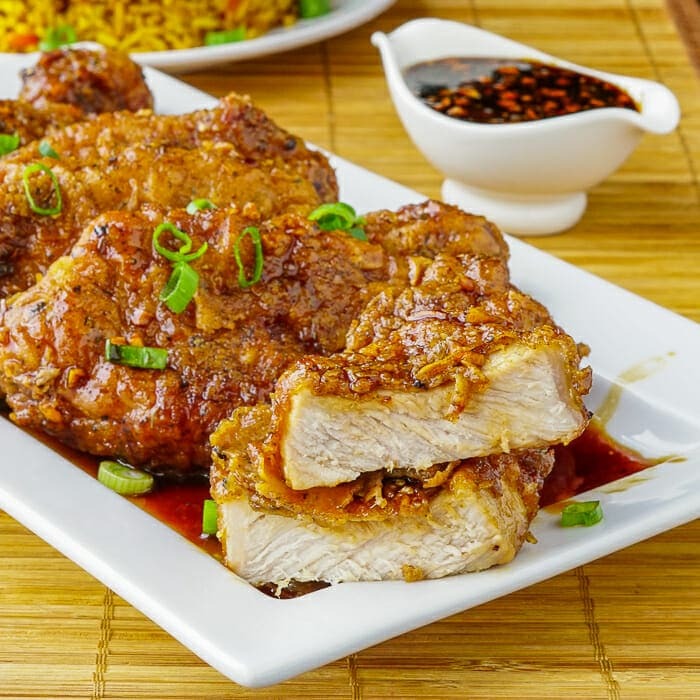 Here, both the crispiness of chicken wings and a very flavourful but easy to make Honey Garlic Sauce get combined to produce one of the best pork chop recipes I have ever tried. The kids absolutely loved it too. After 7 years and millions of views online, this recipe is still going strong. Our family continues to enjoy this meal on a regular basis, as do countless other folks who love this recipe and have made it part of their regular dinner rotation. Just last night we had it again with another family favourite side dish, a delicious version of Spicy Turmeric Rice, as seen in the background of the new photos which were also updated today. 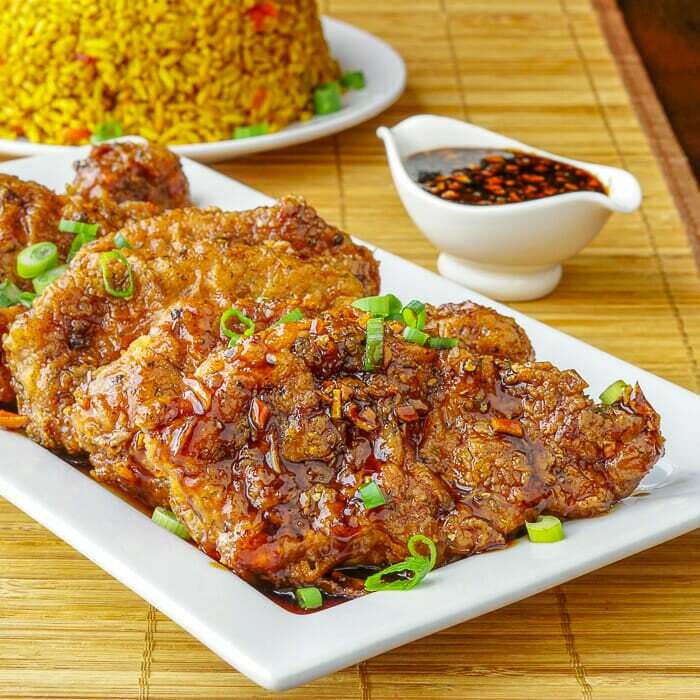 Like this Honey Garlic Pork Chops recipe? You’ll find plenty of other delicious recipes in our Pork Category. You will definitely also want to try this recipe with chicken breasts too. 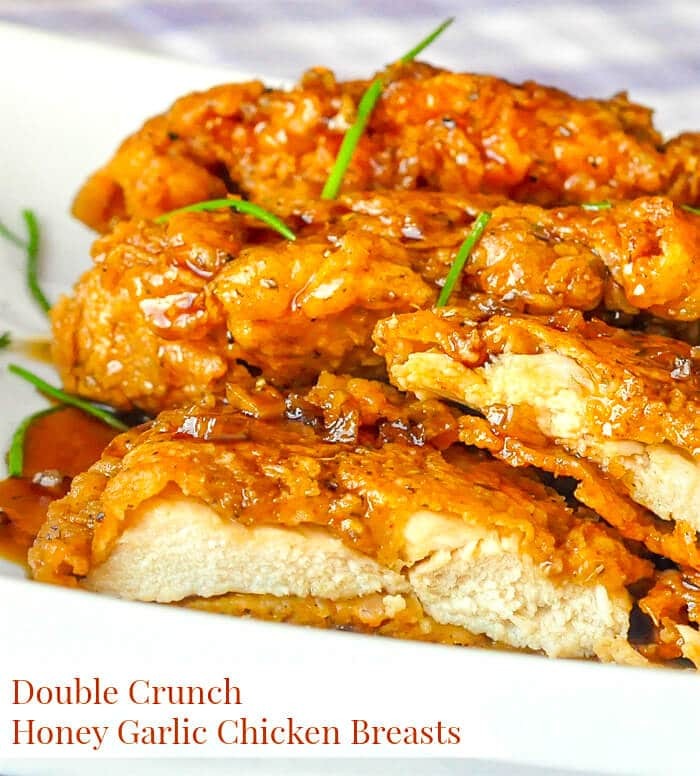 Double Crunch Honey Garlic Chicken Breasts is one of our most popular recipes ever. Double Crunch Honey Garlic Pork Chops - juicy on the inside but super crunchy on the outside, these double dipped pork chops get dipped in an easy, flavorful Honey Garlic Sauce. Sift together the flour, salt, black pepper, ground ginger, nutmeg, thyme, sage paprika and cayenne pepper. NOTE: This flour and spice dredge mix is sufficient for two batches of this pork chop recipe. You can store the leftover mix in a Ziploc bag in the freezer for the next time you make this recipe (or the chicken version)...and there will be a next time. 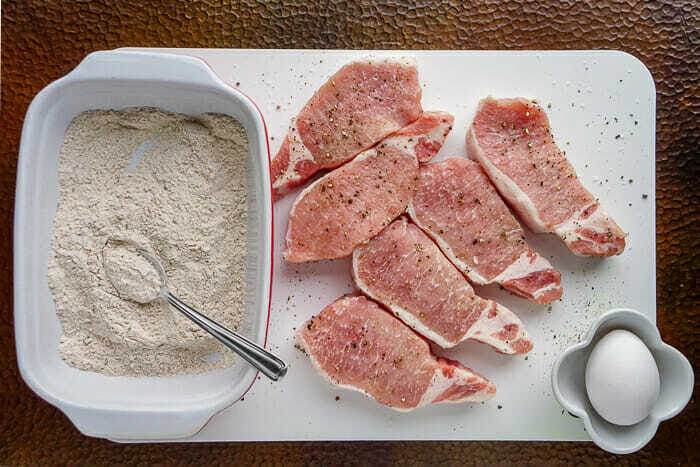 Season the pork chops with salt and pepper, then dip the meat in the flour and spice mixture. Dip the chop into the eggwash and then a final time into the flour and spice mix, pressing the mix into the meat to get good contact. Heat a skillet on the stove with about a half inch of canola oil covering the bottom. You will want to carefully regulate the temperature here so that the chops does not brown too quickly. T I find just below medium heat works well. I use a burner setting of about 4 to 4 1/2 out of 10 on the dial and fry them gently for about 4 or 5 minutes per side until golden brown and crispy. Drain on a wire rack for a couple of minutes before dipping the cooked pork chops into the Honey Garlic Sauce. Serve with noodles or rice. Hubs hates fruit with his pork, and it’s raining so the grill is out. I think I’ll give this a try tonight. I made this last night and it was absolutely DIVINE!!!!! This was an excellent recipe. A little too much pepper for me, but that’s an easy fix. My whole family absolutely loved it and that is saying a lot since I have extremely picky kids. Thanks for the recipe. It han now become a family favorite. This was great! I didn’t not have any sage on hand, and only had a 1/4 cup of honey. So I cut that back to a clove of garlic and eyeballed the soy sauce. I only used 2 porkchops. Really great! Made this tonight and even my husband loved it! it’s the first time I made anything “chicken fried” without burning it. Your instructions were perfect! I didn’t have honey but I whipped up some mushroom gravy that worked nicely and hubby liked french dressing with it. Will definitely make again and will make sure I have honey this time. I made these tonight and they were delicious! The sauce was a very nice complement to the pork. Wonderful recipe, thanks for sharing! Made this tonight! Loved it! The porkchops were a little pink so they needed about 5 more minutes extra cooking for me, but I will definitely be making these again. Dinner was amazing tonight, thanks to this recipe! Yummy! Made this tonight and my husband and I LOVED them!! Will definitely be making this again. Thanks for the recipe! So glad it worked well for you Dixie! This recipe always gets rave reviews and is consistently one of our most visited recipes every month. chicken fried steak…yummy! Thanks for sharing so many wonderful recipes. These pork chops are A-FREAKING-MAZING!! My husband’s not a pork chops lover and he said these were the best pork chops he’s ever had and doesn’t know if they could get any better! My picky family loved it. It’s also still great as leftovers. Next time I’ll only use 1/4 tsp cayenne pepper. It has a slightly spicy after taste kick. I found this on Pinterest also. We will definitely make this again. Thanks for the rave review Sarah…I just had to share it on our Facebook Page. Have you joined us on Facebook yet? Just made these and they. are. DELICIOUS. End of story! Everyone needs to try them!!!! Thanks for the recipe! Made these for dinner tonight. i’m a really picky eater and i surprisingly enjoyed these. mine didn’t turn out very crispy…and suggestions? Maybe your oil was not hot enough or you were crowding the pan? Loved the sauce and the crunchiness of the pork chops. My husband isn’t so much a fan of sweet sauces with meat but he said this recipe is pretty darn good.The key is to use a good heavy bottomed pan or cast iron skillet and use an oil thermometer to make sure the oil stays around 350 degrees. Mine were so crisp and delicious! Outstanding! Destined to be a family favorite. Even the picky kids ate every bit. Thank you!! Made this tonight. It’s SO GOOD!!! Nice and crispy, juicy, golden brown, and delicious!!!! Made this tonight, it was delicious! I did cut down on the honey. Also made with 4 boneless chops, since that is what I had, could have used 1 egg, but didn’t see the 6 yield until after I started. Very crispy and juicy. Served with brown rice and broccoli. Thank you! Made this last night! so good I kept wishing I made more! thank you! Thanks for the delicious recipe! I made it last night. I did substitute chicken for the pork because the kids weren’t in the mood for pork. They loved it. We’ll probably try it with pork next time! Thinking about making this but modifying it to be gluten free, has anyone attempted this yet? Alright, did it and it was a huge hit! A friend told me she used rice flour with good results. She made no mention of the soy sauce but tamari should be fine. Is there any real amount of gluten in regular soy sauce? Yes for people with Celiacs disease soy sauce has enough gluten to make my daughter throw up 🙁 I ended up using the Tamari and a flour mix that I make and keep in the fridge. It turned out great. i used local organic honey which has a stronger taste then the store bought honey so I should have cut the amount in half. I made this for dinner this week and it was a huge hit! Everyone liked their plates clean :). I did use chicken instead of pork. We loved it! Made this tonight and I am not one to eat pork chops but I actually ate the two that were made. Very tasty! I made this the other day and it was fabulous — but my crust kept falling away from the meat. I am trying it again – perhaps I did something wrong? This Recipe was soo wonderful. I am nt a big pork chop fan so I used a pork tenderloin and sliced it thin and did mini patties. It was a huge hit and fed about six people. I will make this again for sure. I just made this recipe with chicken breasts instead of pork chops. I pounded the chicken breast to about an inch thick and then followed the recipe as directed. They turned out awesome! So many great flavors between the breading and the sauce! Good to know that it works well with chicken breasts because I always seem to have those on hand. well, i tried this recipe tonight and my family liked it. it’s definitely different than anything we’re used to. i forgot to cover the chops while i was frying them and the breading looked good, but the chops weren’t done inside. however, they were an inch thick, so that might’ve contributed to it. however, overall very nicely done, and wouldn’t mind having it again! Tried this recipe tonight (from Pinterest) and it was the best dinner I have made in a long time. My husband and I both have seconds and even my picky son ate it without complaining. I’ve never really fried anything before, so I was super impressed that it came out so awesome! Definitely adding to our rotation! Excellent. Easy recipe, had everything on hand. Nice flavor. I’ve added the recipe to my rotation. Thank you. Oh my gosh – YUMMM! I made this using the thinner fast-fry chops; didn’t take long to cook and were so juicy. Don’t fry very often but will surely make an exception or two more often! Thank you for this amazing recipe! I can totally see it being part of my regular rotation. My picky child even ate it and loved it. The only thing I would change is to cut the nutmeg down to a teaspoon instead of a tablespoon. Everything else was perfect. I will also make a double or triple batch of the flour mixture and pour what I need onto a plate so I can save the rest. That will make dinner even faster. Can’t wait to try this with chicken. This is cooking right now…I’m so freaking excited. Been stalking the recipe for a few days after finding it on Pinterest a while ago… We’re making eight of them; because I know it’s going to be good and we will want seconds. Found this on Pinterest and the photography alone drew me to it. I made the recipe last night with chicken. Most unusual mixture of spices but my husband loved the flavor. I doubled the sauce so we could have some for our side dish of rice. Will be making again. Very good. I would cut down on the receipe for the spices. I had a lot left over. Very tasty very easy t make. I am a culinary student and made this for my husband and he about died!! In using this as one of my project of what dish represents me. Sweet and sassy! Excellent recipe!!! my husband said this is the BEST thing I’ve EVER made!!! Thanks for this one, it was a big hit! Very tasty! Served it up with buttered rice and steamed broccoli and the sauce was awesome over it all. Definately give it a try! You won’t be sorry! Wow! I’m all about the sauce and yours sound delicious! Cannot tell you how much we loved this dish! It was fantastic! I’ll probably be using both the flour mix and the glaze on other meats as well…sometimes together and sometimes not! Yummmy!!! So grateful for this delicious recipe – I will definitely be sharing it with others! I finally made this tonight. It was really yummy. The next time I make this I will cut the pork chops in half. They are from Costco and are super thick. This made the cooking time longer, and as I was worried about them being pink, I kept cutting into them to make sure they were done and I messed up the crunchy outside. I served them with mashed potatoes and carrots. I am all about the sauce, and I drizzled some sauce on my potatoes. YUM! When cooking the sauce, rest a wooden spoon over the top of the saucepan. It won’t foam over. I read this somewhere and it totally works. I don’t know what it is about the wooden spoon that prevents things from boiling/foaming over, but it does. Anyway, really enjoyed the recipe. Thanks. I will definitely be making these again, and I’m trying it with chicken next time. Made this dish last night served w mashed potatoes and garlic cheddar biscuits. I don’t like pork but the rest of my family went ape $hit over it! Excellent directions. I made 4 chops so used 1egg for wash and I eyed the flour. I didn’t have nutmeg so I used all spice. Nonetheless, it was a HUGE success. Is the soya sauce suppose to be soy sauce? Can I try this recipe with chicken and beef also? Does it taste good or doesn’t suit with it? We’ve never made it with beef but it’s been a very popular version with chicken on our website too. Made this tonight. Crispy and moist. Delicious! Easy to follow directions and made according to the recipe. Just the right spices. I made fried rice which made a great meal. Will make this again for sure. I’ve been meaning to make this for a while and finally got around to it. Easily the best pork chops I have ever had. The only bad thing is I really just wanted to keep eating! Quick and easy, on the table in no time, and my three year old loved it too. Five stars! This is an excellent recipe; my whole family loved it. The only change I made was to cut the pork chops into bite size pieces. Not a huge fan of pork chops, but had some in the freezer that needed to be cooked up. Amazingly, I already had all the ingredients on hand. This recipe is fantastic! Tasty, juicy, easy to make. Wonderful with mashed potatoes. Definitely cover the chops while cooking – really speeds up cooking time. 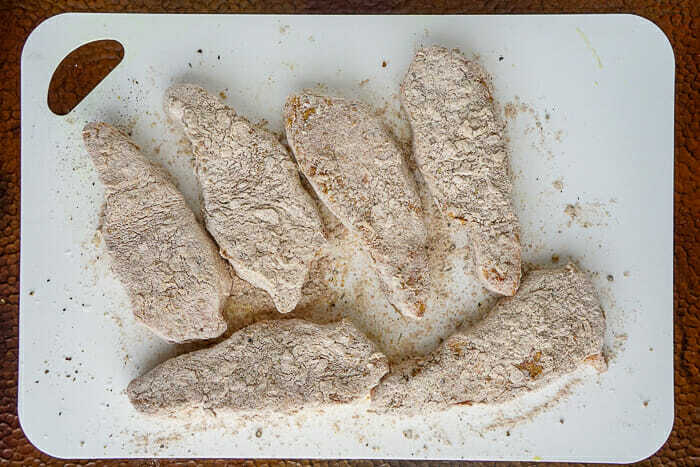 Okay Barry…got some great chops….gonna try this recipe this week! Gonna try this week this week! Was going to ask what someone else already did! 🙂 These were delicious and that sauce is awesome but my chops didn’t turn out very crispy…I don’t think my oil was quite hot enough and I cooked four at a time. Next time I’ll cook smaller batches and have my oil a little hotter. Thanks for sharing Ill be making this again!!! I will try this recipe tonight. Sounds tasty. But I find most pork chop recipes leave the pork too dry. I think I will follow most of this recipe, but will brown the pork chops in olive oil, then place them in the oven to bake through. When I do this, I normally cover the dish with aluminum foil to keep the pork chops moist. I will definitely try the honey garlic sauce, as it sounds delicious! It is a mistake to cover anything crispy with aluminum foil. This creates steam inside the dish and that leaches out moisture. That’s a sure way to get dry pork chops IMHO. Invest in a meat thermometer. When the internal hits 150 degrees F or higher they are definitely done. Thanks so much for this recipe! (Found on Pinterest) these turned out wonderful. Everyone loved them and I only wish we had more pork chops so I could have had a 2nd one! This sauce is so delicious, would be really good with chicken also! Thanks Jaime and yes it is great with chicken. In fact the chicken version is the most popular recipe on our website….out of 1300 original recipes!! I made this recipe last night and it was SOOOOOOO Good!!!! I want to make it again tonight!! Its definitely going in my dinner rotation! It gets rave reviews every time! So glad you enjoyed it. Have to make it for my son when he comes home from his French summer school this week. It’s his favorite. Made this tonight and my pickiest eater, my son Kaiden who is 6, loved it! I’m good at over cooking pork, however, your tips worked and it turned out juicy on the inside and crunchy on the out! Thank you for this recipe! Glad your family enjoyed it! We get a lot of picky eaters who seem to love this recipe when they try it. It sure is popular. Be sure to try it with chicken breasts too. This was DELICIOUS! Five stars for sure, this will be in the dinner rotation! We just recently started cooking with pork more so I was a little intimidated to try frying, but it turned out so well and was much easier than I thought! Thank you for sharing! So glad you had such a success. It sure is a popular recipe. These were absolutely fabulous! I omitted the cayenne due to my four and six year olds but it was still delicious! Tasted restaurant quality which is hard to achieve for me. Fantastic recipe! So glad you liked it. It seems to be a kid favourite everywhere. By far the best chop we have ever eaten. we will be making this often. So glad you liked them Mike. My son whines for these on a regular basis. I swear the kid could love on this and chicken parm for the rest of hos life. All the best, Barry. Glad you enjoyed it. It’s one of our most popular recipes. Just made these for dinner tonight and LOVED them. Thank you so much for the recipe. Also, thank you for adding in that the honey mixture may foam over the pot! Disaster averted. It’s those kind of tips that I look for in a recipe and like to include them where possible. This was the best pork chop recipe I have ever made! I don’t usually like or eat pork because I can’t find a great recipe but this was fantastic! I am definitely putting this on the list of recipes to make for my fiance! Glad you had such a success. They are popular chops around here, for sure. 2 out of 3 of my kiddos loved this recipe and so did my husband who rarely rates pork. I loved the crunchy texture of the coating. It reminded me of Chinese food. Would definitely do this recipe again! Would it be possible to substitute corn starch in place of the flour? My sister is gluten-intolerant. I have heard from some folks who have done just that. I made these tonight for dinner and used eight thin, boneless chops. Perfect! Everyone loved them and I will be doing the recipe later this week with chicken. Even the finicky 17-year-old went back for seconds. The seasoning blend on the pork was so savory and delicious and the sauce was just an added bonus. My son wants to eat the sauce on everything. Thank you for sharing. This was amazing. Usually I make changes to recipes to suit our tastes, but didn’t change anything with this one. I made it with homemade fried rice and oven roasted broccoli, which were perfect compliments. I will definitely be making this again exactly as is. Fantastic. So glad to hear it. I absolutely enjoyed this recipe! Saying it was delicious is an understatement! So glad you enjoyed it. It’s pretty popular! I would love to try this, is there any other kind of oil I can use, I dont have canola on hand? Any vegetable oil is fine for frying. OH MY GOODNESS…. This was outstanding… Thank you so much for sharing…. Hi. I just pinned this from Pinterest while I was searching for “Low calorie recipes”. This doesn’t sound low calorie but I may be wrong. Do you happen to have the nutritional info for this? I am making it tonight. Thanks. Pinterest categorizes these things automatically. They are probably referring to the baked version included in the recipe. I don’t do nutritional info, I’m afraid. Hi Barry! You mentioned a baked verison included in the recipe, but I must be missing it! Should I follow the instructions that are on the chicken version? I suppose I can google this…but if you have any thoughts I would love to know! Thank you!! Yes the instructions for the baked chicken version will be fine. I made this last weekend. They were marvelous and my husband couldn’t stop raving about them. We will definitely do them again and use this honey garlic sauce on other meats as well. Thank you for sharing. yumm yumm. I made this last night and it was absolutely amazing. My two 9 year-olds who are very picky eaters both loved it very much. I just can’t get over how good this was. Fantastic to hear Sallie! Be sure to try it with boneless chicken breasts too. My kids love that too! Made this tonight and yummmm! I love all the flavors and its super easy to make. I kept half the flour mixture for my next batch because I only used 4 chops. The only thing I didn’t get it the cooking time. At 5 mins each side, my chops were still raw. I did 3 mins longer per side. Timing does depend on the thickness of your chops and their temperature when they hit the pan. Taking them out of the fridge for a half hour or more to get them to almost room temperature helps a lot with even cooking. Making this tonight for dinner but I only have vegetable oil, will that be okay to use instead of canola oil to fry in? I’ve had this pinned on Pinterest for a while and made it tonight for dinner. Oh my goodness. It is absolutely wonderful. The glaze is out of this world amazing. I will be making this again and again for sure. Thank you for sharing. This is an awesome recipe! Needed something different than the same old same old and the whole family loved it! Thanks! 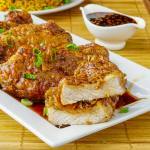 I love this recipe for Double Crunch Honey Pork Chops. I usually mix up Maple Syrup and some mustard sauce. That is tasty as well, but no spices. Your husband’s recipe sounds tastiier. Thank you for this recipe. We love sauces and this honey garlic glaze is perfect!! I added a dash of balsamic vinegar and every flavor popped!! I’m not in the habit of leaving comments, but I had to let you know! This sounds and looks like a very delicious dinner or supper dish along with some vegetables and/or salad. I have already saved it to my favorites and I thank you for this tasty dish. Just curious….I scrolled all over but it’s 5am LOL. Do you or anyone know the calorie count and fat grams per serving??? Total fat preferred but if you know saturated that’s cool. We don’t provide nutritional info, sorry.